A 1948 issue of The Hotspur features the 1947 Mille Miglia road race. Homepage. 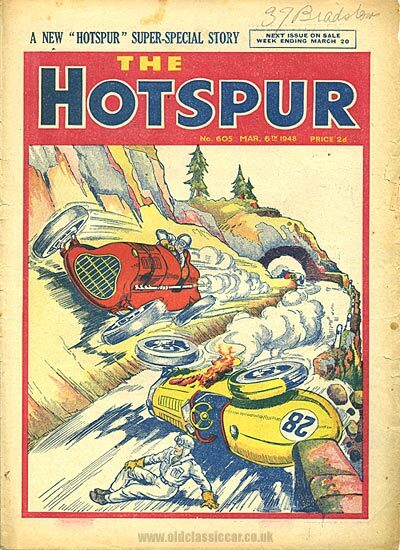 This page: Drivers dicing for the lead in a race on the cover of The Hotspur comic. This is the second issue of The Hotspur to feature on the site, the first - from 1955 - features a Standard Eight on its cover, while this issue from 1948 depicts drivers on the Mille Miglia racing each other along a treacherous mountain pass. A number of classic comics that feature motor-related scenes on their covers already feature in this section, while elsewhere are many examples of children's annuals with motoring, or motor-racing, cover illustrations. The Mille Miglia road race in Italy. Our cover shows an incident from the longest and toughest road race in the world - the Italian Mille Miglia, the thousand miles race. The race starts at Brescia, in Northern Italy, and the course is a giant figure of eight reaching as far as Rome and finishing up back again in Brescia. Everything to test the skill and stamina of the drivers is included in the race. The mighty Appenine Mountains have to be climbed twice, crowded cities, twisting village streets, pontoon bridges, river fords, and mountain passes are all encountered on the road. More than half the cars fail to complete the course usually, and the drivers need ice-cold nerves and wrists of steel to stay the pace. Last year the winner thundered over the finishing line just 16 hours after he'd got the starter's flag! The course was 1,125 miles, and his average speed was 69.9 miles an hour. Some speed - some man - some race! The Mille Miglia of 1947 that is referred to in The Hotspur comic was the first post-war running of this classic race, won by Clemente Biondetti in an Alfa Romeo, finishing one place ahead of the great Nuvolari. The mileage exceeded 1,000 miles because at that time, a number of bridges across the Po river remained out of action following damage sustained in the war, requiring a number of detours. The illustration on this comic shows car number 28 ablaze and on its side, presumably retiring from the race. Car 28 though was in fact not a single seater sports/racing car at all, but a diminutive Lancia Ardea saloon, which completed the race in 26th position.